In the below topology, L3SW1 is a physical 3550. I have configured several vlans ( 40, 20, 1) on the 3550 and on the generic GNS3 switch. The physical port on the 3550 that connects to the map is configured as a trunk as is the port on the generic GNS3 switch. The XP machines are Windows XP virtual machines running in Hyper-V on this machine. From XP1 I can ping all the SVIs fine, but I can't ping passed the SVI. Same for the switch. I can serial into the switch and cannot ping XP3 or XP2. It seems devices that are in vlan 1 ( the 3550, R1 and XP1) can ping their local gateway as well as the other two SVIs, but that's it. I also confirmed that I can disconnect the switch and configure R1 for router on a stick and all vlans can talk amongst each other. So it is definitely something with the 3550 that I am over looking. Been playing with this some more. So I connected another ethernet adapter to fa0/20 on the 3550 and the used a cloud in GNS3 for that port and another cloud for another XP vm. 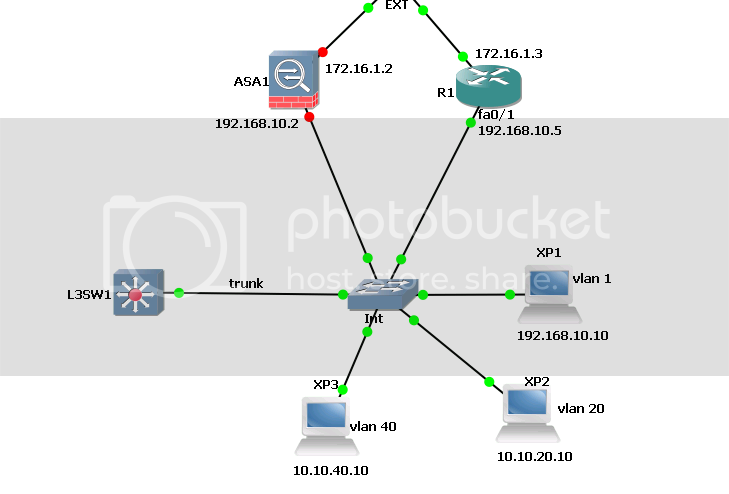 I had to use a GNS3 switch to connect the two clouds, but that at least gives me a client directly ( sort of ) connected to the 3550. I still cannot ping even the default gateway, much less to other vlans. When I put the port into vlan 1, I can ping devices in vlan 1 as well as the SVI for the other vlans. Can't figure this out. It's getting annoying. EDIT: Ok, suddenly the vm connected the second port on the switch, fa0/20, is now pinging all layer SVIs, its gateway, and a router on vlan 1 from vlan 50. So that's an improvement, but it still cannot ping any of the other xp vms in vlan 20 or 40, but can also ping the xp vm in vlan 1 right now. Oddly enough, I can ping the xp vm in vlan 1 from the xp vm in vlan 50 connected to the switch, but I cannot do the reverse. This is extremely puzzling. I have seen some weird stuff like this where only broadcasts get through, but that was between a local host and an external interface. I've never played with Hyper-V (because I use VMware Fusion) so something similar may be going on. However, even if this is the case, it does not help you much. But at least it might be worth looking at. Do you have another PC that you could use to to a port monitor of the VLAN trunk port on the physical 3550 to verify that the correct packets are being received and sent with the correct tags?